At Chariots of Desire, we strive to find unique cars that meet our customer’s requirements and are in top condition but have not been over advertised in print or on the internet. Our sales brokerage is completed securely and without publicity. Aside from vehicle consignments we can provide vehicle storage, long or short term at reasonable rates, together with top notch mechanical services from the highest rated facilities. Pre-purchase inspections are offered on a national basis and full auction services, including buying, selling or absentee bidding. 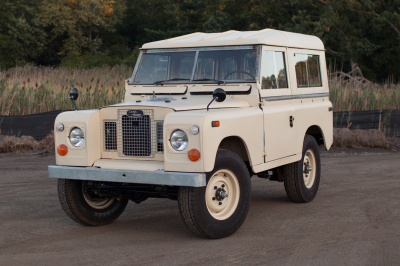 This 1971 Land Rover Series IIa was lost in a West Virginia barn since 2001 with a reported 30k original miles when found. The vehicle was retrieved and then subjected to a total restoration starting with a brand new frame. At the same time the vehicle underwent a total upgrade to make it into a modern high performance road vehicle without losing any of its incredible off road performance, for which these great vehicles have been known for during the past 70 years in which they have been manufactured. Not only was this process a vehicle performance upgrade but it also included custom installing modern driver and passenger conveniences such as a bespoke sound system, up to date air conitioning and use of lightweight alloy body panels to eliminate rusting with age. 2017 Chevrolet LTG 2.0 GEN III Engine – 272 HP / 295 FT-LBS, Tremec T56 6-Speed Manual, Forbyn Brothers / 2:1 Hi, 1:1 Lo, Land Rover Salisbury Military – 4.11 Gears w/ Detroit TrueTrac, Forbyn Brothers 4-Wheel Disc, R-M Diamont, Land Rover Limestone Basecoat, Matte Clearcoat, Original Patina on Galvanized Metal, "Black Bridge" Custom Gauges, RestoMod “Bantam II” Air Conditioning System, Heated & Cooled Front Seats, Hidden Bespoke Stereo. ​We pride ourselves on exceeding our clients expectations and understand what it takes to establish and maintain loyal relationships with each of our clients. We assist in every aspect of the luxury car business for sales, auction acquisition including purchasing and selling as well as absentee bidding, consulting, transport, storage and appraisals. David Bate does what he says and says what he does! My car was one of those rare cars that had so much to offer a knowing buyer although it was stuck in the same conversations as cars with less to offer. David positioned my car to stand out above all the nonsense of other cars. He was persistent and creative. And it worked! My car was on the east coast. It was sold to a buyer in Italy who worked through an intermediary in Germany who utilized a California based car transporter. David coordinated the entire process flawlessly and professionally. I'm happy I met David. I doubt another agent could have done what David did.